The Legislative Black Caucus announces its priorities at the beginning of this year's General Assembly session. At the top of the list is bringing African American-owned growers into Maryland's medical marijuana industry. A bill intended to diversify Maryland’s medical marijuana industry gained initial approval in the state Senate Monday night. 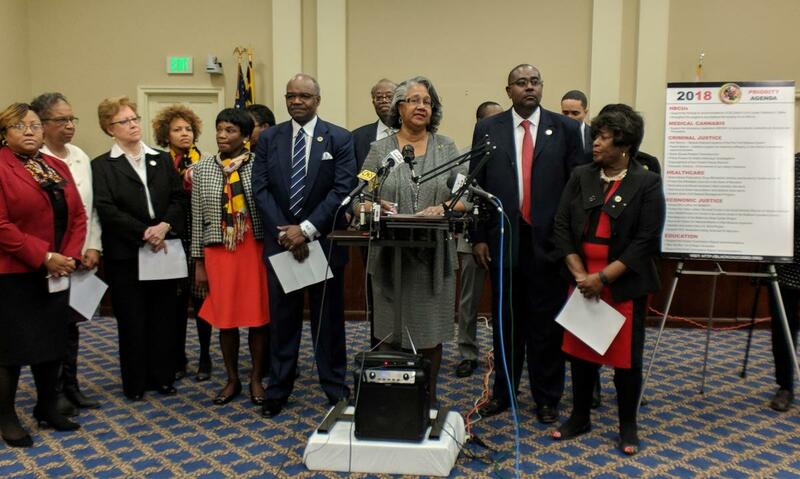 The legislation is the state Legislative Black Caucus’s top priority in Annapolis this year. The legislation makes several changes to the fledgling industry. Chief among them, it alters the make-up of the Medical Cannabis Commission, which oversees licenses to grow, process and dispense the drug. It adds seven licenses to grow marijuana, and it creates a fund to help low-income residents access the drug. Sen. Brian Feldman, a Montgomery County Democrat who presented the bill to his colleagues on the floor Monday night, said the legislation is the result of many compromises. He reminded senators to see the big picture. African Americans make up about a third of the state’s population, but no African-American-owned firms won licenses to grow the drug. The Legislative Black Caucus has fought for two legislative sessions to change that. The bill has already passed the House and is likely to get a final vote in the Senate in the coming days. But with just one week remaining in this year’s session, there could still be a fight ahead over variations between the two chambers’ bills. Last year, a similar bill died in the final moments of the session. Sign up below and get our newsletters right to your inbox!